Plenty has been written about this, and yet.. Social Media / Social Networking news and buzz are so dominated by the platforms that support it that it is quite easy to forget that thinking about those is by no means the 1st steps you should take..
Why are you thinking about Social Media? Do you want to establish a relationship with a specific audience niche that will allow you to better understand and satisfy their needs? Do you have a product/service and it is your intention to drive awareness and enthusiasm for it? Do you want to have your user community help each other how to better take advantage of your product/service? Understanding who you want to engage with is important to determine where and how; not everybody likes to “hang” in the same places as others, interact the same way, or respond to the same incentives. Note: check the Groundswell profile tool however I advise to do it with a grain of salt; I think it only reflects how successful we have been to activate specific profiles, versus any natural tendencies that any given profile has. Or maybe this is audiences that lacks yet a location/opportunity (that has reached a decent critical mass) to self express and interact? Maybe then you have an opportunity to create such space and facilitate this to happen. 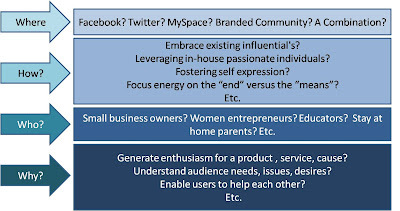 Technology and platforms are the last step; this does not mean is not important (quite the contrary, it is very important); but the focus here has to be on supporting the prior steps plus two key criteria elements: a) Is your audience already “hanging together” in an specific social media location/platform? and, most importantly, b) what is the experience you must create to achieve your objectives, and what platforms allow you to do that?